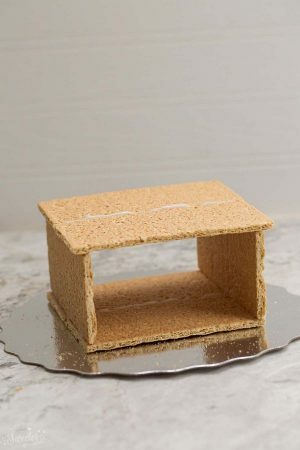 Easy No Bake Gingerbread House – a simple way to make a “gingerbread” house using graham crackers and nuts. 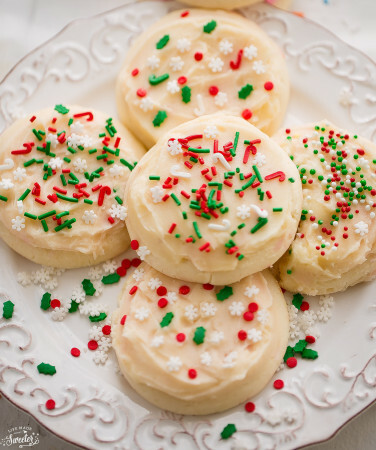 It’s the perfect holiday activity for the kids and best of all, no baking required! Plus a short video. It’s almost officially the holiday baking season and I’m thrilled that I can finally start sharing some festive treats around here. You might remember that my insanely enthusiastic husband puts up our Christmas tree every year immediately after Halloween. In the past, I’ve always tried to tell him to hold back but now that we have two little ones who squeal with excitement every time we turn on the Christmas lights, I have learned to just go with the flow. 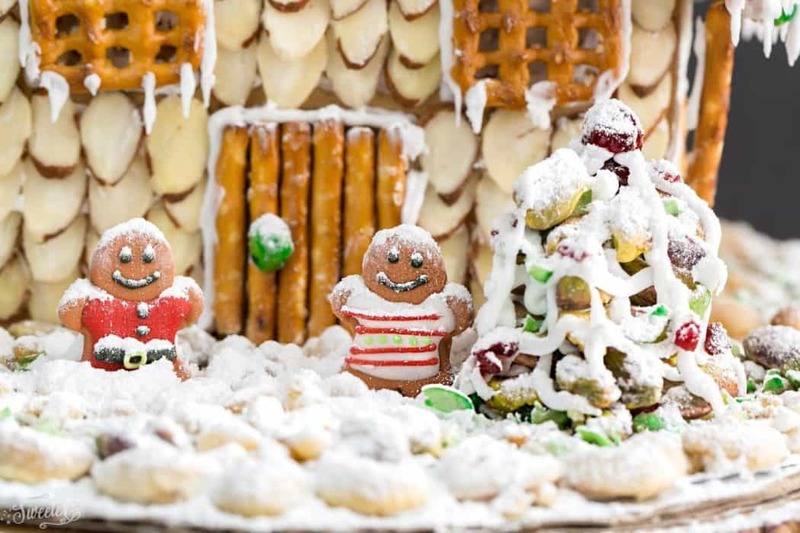 Another holiday activity we look forward to every year is building a gingerbread house. It’s one of our favorites and the kiddos always have a blast. 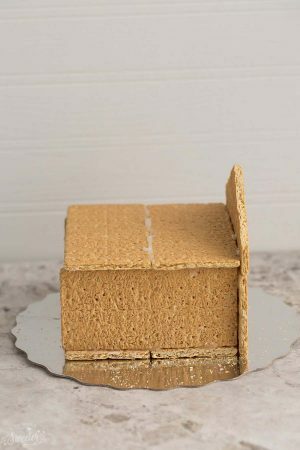 This year instead of going the traditional route with a homemade gingerbread dough and candy, we decided to use graham crackers for an easier no-bake version. 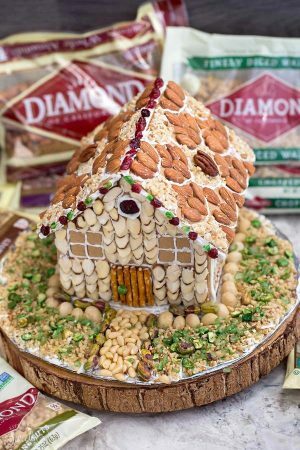 And as a healthier option, we decorated the house with an assortment of nuts from Diamond of California since we love the quality and the variety they have. 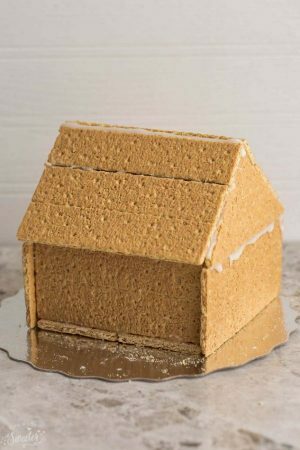 To assemble this No Bake Gingerbread House, you’ll want something that dries hard, so we used royal icing to ensure that the house would remain stable. I usually like to use meringue powder when I’m making royal icing instead of egg whites which you can find at your local craft store or online. It’s a dry powder that helps your frosting to harden and glue like cement. Once you finish building the gingerbread house, set it aside for a few hours so that the icing can set. When you’re ready to decorate, set out the nuts into individual bowls and have a plastic piping bag or sandwich bag of royal icing ready to go. We started off by gluing the bottom of the house to a round cake circle. Then we started adding sliced almonds as the walls for the front and back of the house, pretzel squares for the windows, a dried cranberry for the circle window and pretzel sticks for the door. For the roof, I used a combination of chopped walnuts and whole almonds to create the shingles. 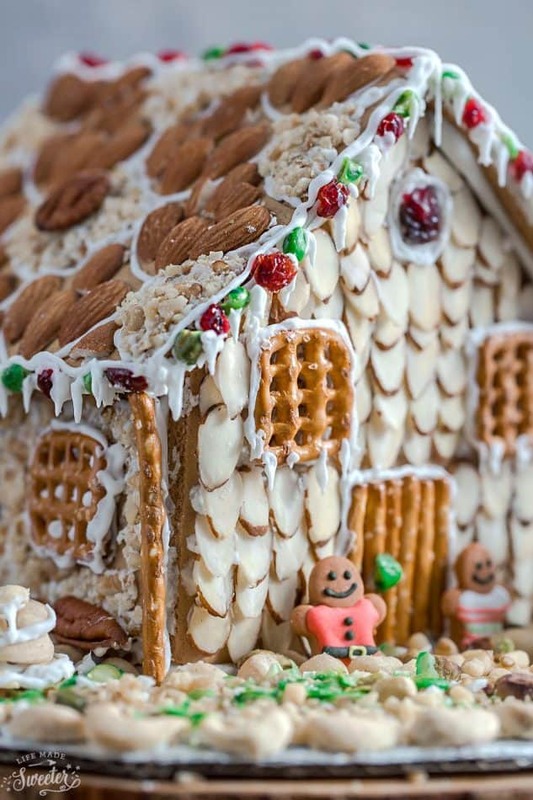 The Christmas “lights” were created by alternating green peas and dried cranberries along the edge of the roof and I lined the corners of the house with pretzle sticks and the bottom sides of the house with pecans. I used pine nuts to create the walkway and lined it with pistachios. Diced walnuts were spread out to create the lawn along with crushed roasted green peas. I made a pine tree using pistachios and frosting and lined the the front of the house with macadamia stones and made a cashew rock boulder along with a cashew lawn border. For an extra fun touch, I added some gingerbread fondant men and sprinkled some powdered sugar for the snow. The kids and I had a blast making this gingerbread house and watching it come to life using nuts. Part of the fun of making gingerbread houses is getting to munch on the decorations during the process. And since we used mostly nuts, I had no problem with the kiddos sneaking in bites here and there. This no bake gingerbread house makes it easier to enjoy a fun afternoon activity with the family during the holidays. Disclosure: This post is sponsored by Diamond of California. All opinions are 100% my own. 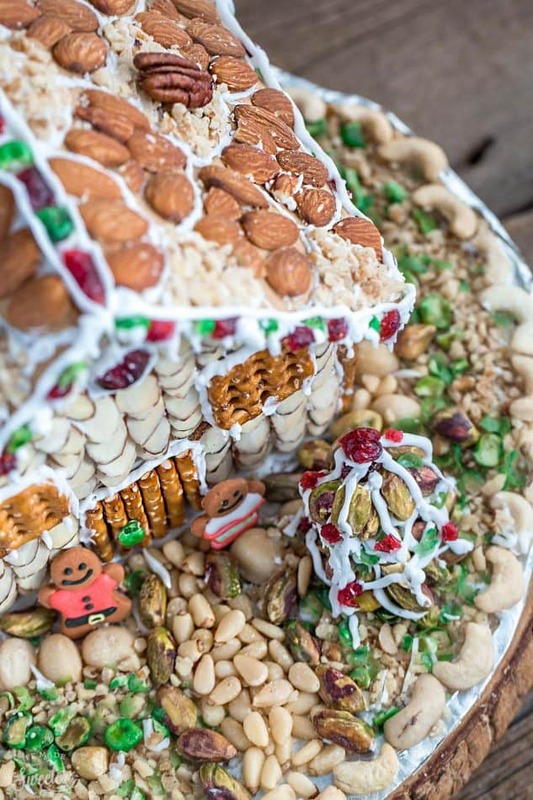 Create the intricate and fun gingerbread house recipe using a variety of nuts! Almonds, walnuts, pecans and more give this Christmas tradition a delicious upgrade! In the bowl of a stand mixer, whisk together meringue powder and powdered sugar. Add warm water, 2 tablespoons at a time while mixing on high speed for about 5-7 minutes or until stiff peaks are achieved. Add more water as needed if too running but the consistency should be thick enough to hold the house pieces together. Transfer to a piping bag or a zip-top bag with the corner snipped off. Place two graham cracker sheets on the cake circle to form the floor. Pipe icing in the middle and glue together. Then pipe icing along all four edges, working quickly, place the house's four walls (which should stand across from each other) onto the icing and pipe more icing where the crackers touch vertically. Pipe icing along one side of the house and glue one graham cracker on top of it to form a roof. Allow time to dry and harden. 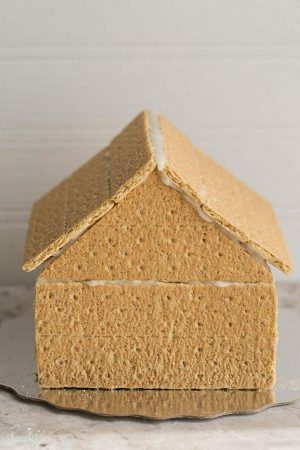 Snap a graham cracker into two rectangles and attach to the roof and side of the house to close off the roof. Repeat with the other side. Cut a triangle for each end of the roof from two separate graham crackers. Secure with royal icing. Set aside gingerbread house for at least 3 hours to dry and set. The house can be made a few days in advance. Add sliced almonds to the front and back of the house, starting from the bottom and work your way up and secure with glue. Add pretzel squares for the windows on all four sides of the house and pretzel sticks for the doors. For the door handle, attach one green pea and secure with royal icing. Add a dried cranberry for the circle window. Line the sides of the house with pretzel sticks and the bottom side of the house with pecans, broken in half. Add chopped walnuts to the sides of the house on the roof in a semi-circle pattern. 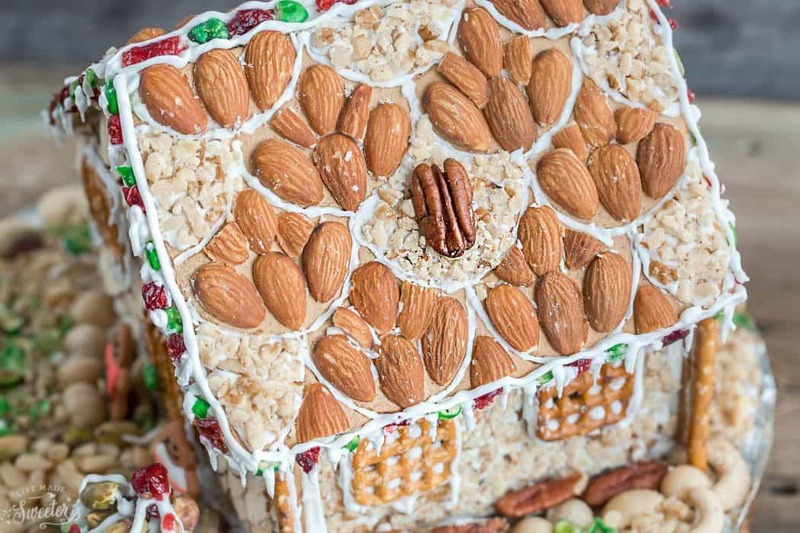 Secure whole almonds diagonally for the remainder of the roof the same pattern and add one pecan for the middle. Add "lights" on the roof using green peas and dried cranberries. Create a walkway using pine nuts and line pistachios along the border. Spread out diced walnuts to create the lawn around the house and add crushed green peas. Pile pistachios in layers to create pine trees with royal icing. Add macadamia nuts for rocks and cashews for a rock boulder and a lawn border around the house. Add gingerbread fondant men and sprinkle powdered sugar for snow. This is the cutest!! 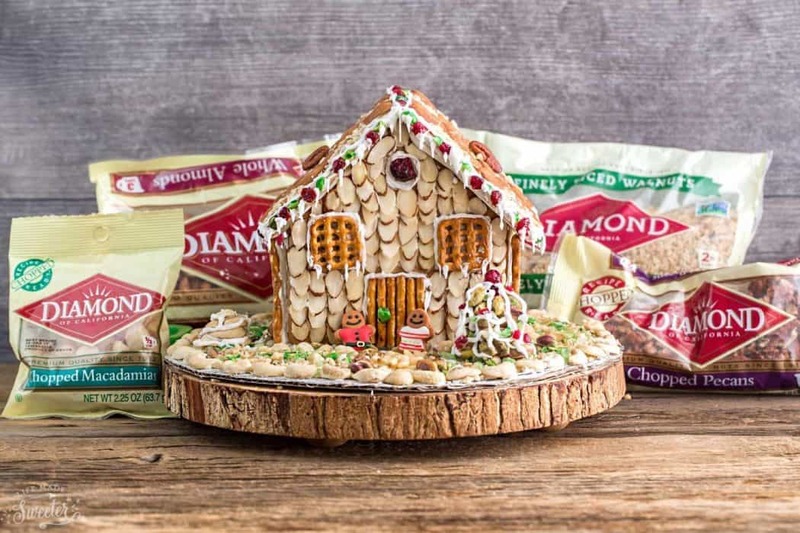 We always build gingerbread houses but have never thought to use nuts or graham crackers! Such a great idea and much healthier to snack on! So fun and festive! Love this Kelly!! Yay for Christmas decorations! Sounds like your family is in the holiday spirit already, I love it! 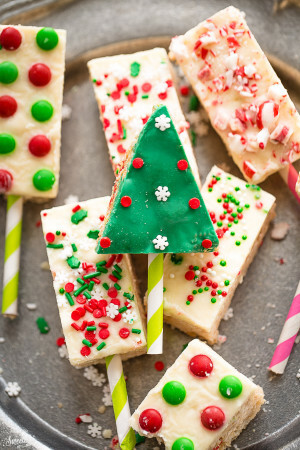 And this is such a festive idea for the holidays! 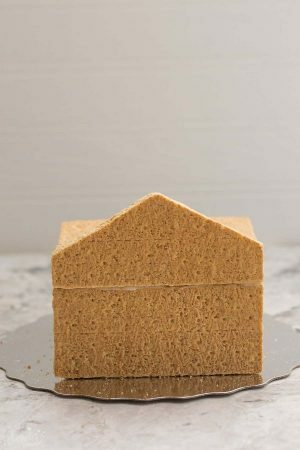 I admit that I usually buy the prepackaged gingerbread houses and make one every year, but I need to try this homemade version. Looks SO easy and so fun! Love this, Kelly! 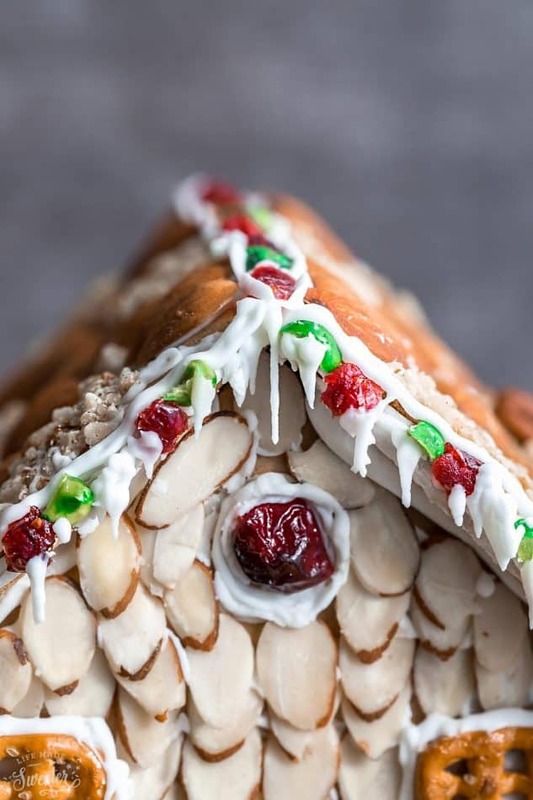 Oh my gosh, this is the prettiest gingerbread house I’ve seen in a looooong time! I can’t even believe that it’s so easy to make! So gorgeous Kelly! o so beautiful and festive! I need to make one too. Oh. My. Gosh. What a pretty looking gingerbread house, Kelly. This is one of the most beautiful gingerbread house I have ever seen. Love how beautifully you have used nuts or graham crackers here. So much fun and festive this is. This is so awesome!! I totally heart this so much! : ) We have a tradition of building a gingerbread house, too, but I have to confess we buy a ready-to-assemble one and do the usual candies! This is so smart and so pretty with all those nuts. The squirrels would love it. haha – don’t you think of squirrels in the wintertime… This is so sweet and looks absolutely gorgeous! KELLY!!! 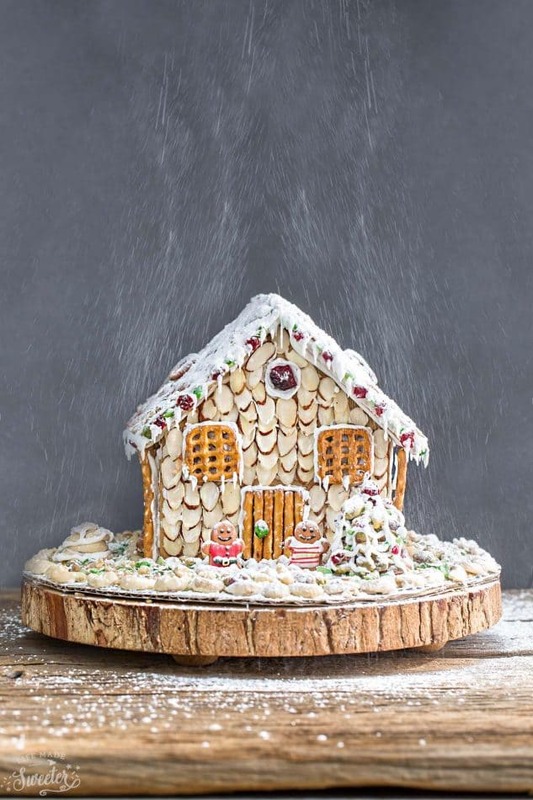 This is the prettiest “gingerbread” house I’ve ever seen — it’s so detailed and just immaculate! My kids made gingerbread houses out of graham crackers in kindergarten and they were so adorable, but THIS! This is show stopping! 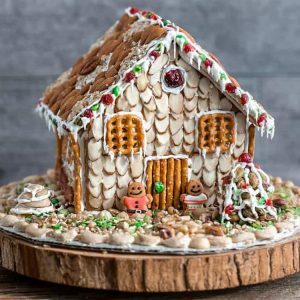 Kelly, this no bake gingerbread house is GORGEOUS! Even though my daughter is 17, we still decorate a gingerbread house every year and this year I’ve gotta get some meringue powder to use in the icing. Thanks for that awesome tip! And hope you and your family have a wonderful Thanksgiving! Yah for festive fun & treats. 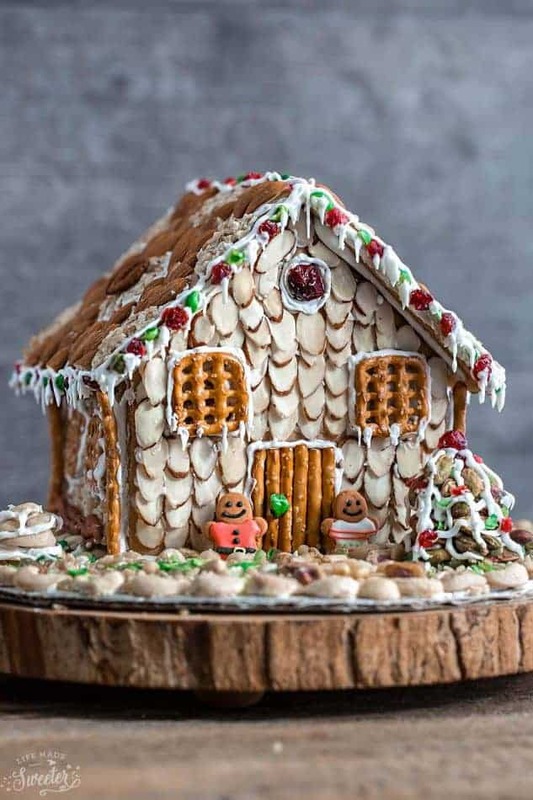 This is a great alternative to a sugary gingerbread house, I love it 😀 I always smile at the thought of your hubby putting the tree up so early, but hey why not? What a fun gingerbread house! We never got that detailed with our gingerbread houses growing up! Love it! This is STUNNING Kelly! Way better than a candy laden gingerbread house! What a beautiful gingerbread house, Kelly! I love that last photo! It really looks like it’s snowing! What a gorgeous gingerbread house Kelly! you did a fabulous job!! This is stunning Kelly! Such a great idea to do a no bake!! I love it!